This track is now fully gravelled and signposted. Worth a look! The Pukatea Track is a 10 minute bush walk between Orleans and Makererua Streets. Tucked away in the back streets of Ngaio is this small reserve. There is a large grassy slope off Orleans Reserve, and the Pukatea Track takes you through the bush via a small gully and across a tiny stream to the Makererua St steps. A side track takes you to an old pukatea tree. The track was created by residents with support from Council and the reserve is being restored by the Makererua St Reserve Care Group. The track is well signposted and easy to follow. 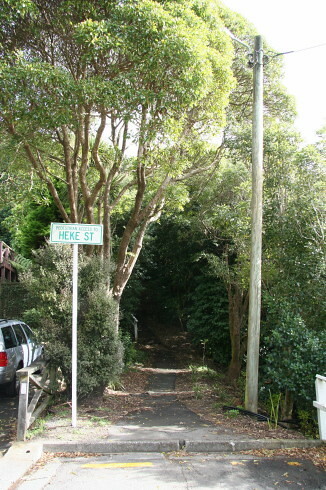 At the end of Makererua Street there are some steps leading up to Heke St (which is near the intersection with Huntleigh Park Way). The track leads off to the right from the base of the steps. The other end of the track begins at the top of a grassy area, off Orleans Street. The track is now well marked through the bush.